In a medium bowl, mix together canned tomatoes, sun-dried tomatoes, garlic, olive oil, and oregano. Season with pepper. Pour tomato mixture into an 11- x 7-inch baking dish. Bake for 15 minutes. Stir lemon juice into tomato mixture, then add the shrimp. 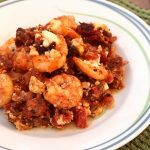 Sprinkle with feta and bake for 15 minutes longer or until the shrimp is cooked through. The recipe timing works best if your shrimp are on the larger side (16-20 count). If yours are smaller, check them after about 10 minutes in the oven. You want the shrimp to be opaque, but not rubbery. Watching sodium? This probably isn't the recipe for you as shrimp inherently has a lot of sodium. Replacing the canned tomatoes with 3-4 fresh tomatoes (chopped), using less of the sun-dried tomatoes, and cutting back on the amount of feta cheese will decrease the sodium count. Buy julienne-cut sun-dried tomatoes packed in olive oil. You won't have to do any chopping and you can use some of the oil from the jar as the olive oil in the recipe. Look for frozen shrimp that have already been deveined.